Later on this week I will be travelling to Reading Festival. It’ll be my second time going after popping my cherry last year and not only am I excited to live in filth for five days getting extremely drunk but I’m also excited to be checking out a lot of new bands over the course of the weekend too. One band who are going to be there are Viola Beach, a four piece band from Warrington who have literally been pushed out of the industry womb like a week ago. 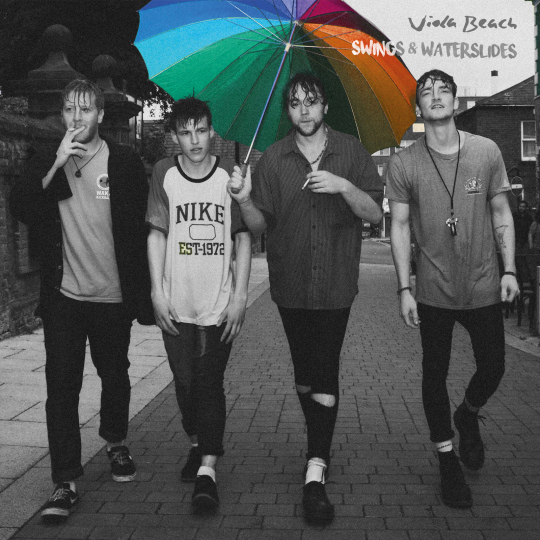 Swings & Waterslides is their debut track and they’ve already been receiving national radio play and will be performing on the BBC Introducing stage at the Festival too. Mental. Complete with intense strums of the guitars, Foals-esque melodies and warm basslines Swings & Waterslides is pretty much perfect for the Festival circuit. Lyrics referencing having a good time and falling in love is essentially talking straight to my feel good vibes and Viola Beach do a fantastic job at surrounding this direct attack to the junk with armour coated with wonderful indie goodness. This is a great summery song from the debutants, and I cannot wait to check these guys out at Reading Fest. I highly recommend you check them out too, and who knows maybe you’ll be stood next to me as I proudly show off my terrifically terrible dance moves. How lucky you would be in that moment. Stream the track below, and for more music reviews, interviews and seriously come say hello if you see me check out Exploding Head Syndrome on Facebook and Twitter.